A local organization is raffling off tickets to a Hummer, with proceeds going to a local eco-center. 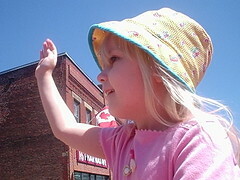 This is Emma on a wagon ride at one end of the city. Actually, our city used to be two towns and at least two villages that all got amalgamated-like. So, there were Canada Day celebrations at one end today. Tomorrow the parade will be at the other end. Tonight? Fireworks. Not for Canada Day, no. The fireworks are to kick off the Rock n Roll Festival, which goes on all weekend. Boy, do we party out here. I hope I see Elvis at the parade. So I have to wake up Emma, and Mom is taking us out and about for some pre-Canada Day celebrations. Lots of pictures forthcoming. Emma and I also visited our eldery neighbours last night, when we went all the way across the street to give them a container of freshly-picked strawberries, of which we have more than our share. I have too many “Emma was SO CUTE!” incidences to tell you about. Especially when she asked me about all the religious pictures on the wall. I told her it was because our neighbor loved God. “God?” she said, “Does He live here?” And she talked pretty much nonstop and my neighbour thinks she is the cutest, most well-loved child on the planet. So, I know they’re mostly looking at political blogs and whether or not they provide some sort of benefit to political parties, but DUDE. “Speech” and “free” usually go together. They wanna police some blogs that ought not to be there? Tackle the pseudo-business blogs full of nothing but ads, and the ones whose entire content consist of feeds from everywhere else. I’ve been tagged twice for a meme now, and I’d better do it before I forget. Once from Carol and once from .. oh shoot, I thought it was one person, but it wasn’t…. so I really forgot. Simple meme, really. List five things you miss from your childhood. (Just five? Now that’ I’m thinking…) Actually, I have a lot of “stuff” and people around me from my childhood, so I guess I’m lucky. 1. Going to my grandparent’s house in Grand Bay for the whole summer. So quiet! 2. Nanny’s chocolate chip cookies. Nanny. 3. biking around the neighbourhood after school until really late, like almost sunset. 4. going to Rockwood Park and staying all day, the taste of damp popcorn and warm chips, trying to climb on TOP of the slide tunnels. Tammy will certainly remember THAT. I know there’s more rules and stuff, but if you wanna do it, go right ahead. 🙂 Lunchtime calls and a gal has to get dressed at some point in the day. You know how, in everyone’s house, there’s one table or area (okay, areaS) that is a challenge to keep clutter-free, because it attracts papers and books and things like a magnet? Yeah, our biggest on is the dining room table, the one we eat off of twice a day. But I finally figured out why we don’t really clear it off totally most of the time. All those stacks in the middle of the table help prop up whatever book we’re reading over lunch.